The Legislative Matters Committee will be meeting on January 15th at 6pm to take up an eight item agenda that includes, as promised at the January 8th Board of Aldermen meeting, a discussion on the timeframe for snow clearance off of city sidewalks. Originally submitted by Alderman at Large Mary Jo Rossetti, the board order quickly drew support from her colleagues who cited numerous communications from constituents concerned with the cut-throat expectations set by the new regulations. 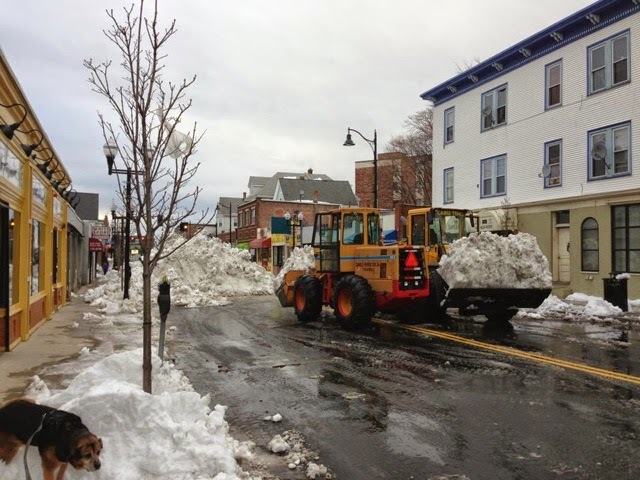 This was not the only legislation focused on snow removal as fellow Aldermen at Large Bill White and Dennis Sullivan submitted a request for a public hearing to give residents and business owners an opportunity to weigh in on the matter. This public hearing has not been scheduled yet as the Board felt an initial conversation in committee was needed first to allow appropriate department heads to explain the reasoning behind the 10am cut-off and how they plan on assisting the members of our community who are physically unable to shovel. Alderman Rossetti chairs the Legislative Matters Committee with Aldermen at Large Bill White and Jack Connolly, Matthew McLaughlin (Ward 1) and Mark Niedergang (Ward 5). Hope and pray that they come up with a more common sense time frame before penalities are assessed. In my opinion a 24 hour window after the last snowflakes fall, would be acceptable to most citizens.... that would cover most contingecies. Historically,in some neighborhoods, commercial businesses (Faukner Bros. Oil at the corner of Cedar and Alpine for one) have been the most at fault for not clearing their walkways; and secondly the city for not clearing frontages to city controlled properties. Parks, etc. Not only does Faulkner property owner not clear their sidewalks; they also add to the problem by plowing their parking lot and leaving huge deposits of snow at the corners where pedistrians have to cross @ Alpine and Cedar. It's noted that the Somerville Chamber of Commerce rents space in the same building and apparently does not make an issue of the uncleared sidewalks. OOOPS, Sorry, Faulkner or one of the employees does shovel a walk. About the width of a shovel going from their back office to their garage across the street to accommodate the truck drivers. So as long as their parking lot is plowed and the truck driver's path is shoveled, the rest of the public trying to negotiate their sidewalks can go to hell in a hand basket. They also own the 6-unit apartment building at the corner of Cedar and Alpine. That walk never gets cleared either. I guess they are too well politically connected to get $$$$ fines.